Four years ago I was diagnosed as celiac at the tender age of 60. 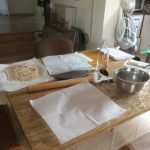 This year marks our 3rd year of making gluten free matzah at our home on Passover. 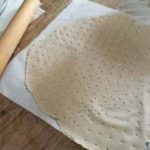 Here is my journey on How to Make the Best Gluten Free Matzah Ever. Thankfully, the matzah gets tastier each year! The only one of the five grains that doesn’t have gluten in it, is oats. That means if you want to make gluten free matzah that you can actually bless on Passover, it has to have oats in it. Some rabbis say 50% or more oats gets a blessing, others say 75%. I am sure you can find many opinions. 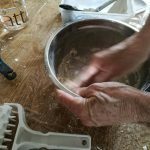 The other important rule is that you have all of 18 minutes to have it baked- from the second the water hits the flour, including mixing and roll out as well as baking! 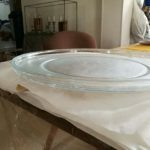 The first year, our matzah was 100% oat flour. It was non edible, and our recipe which included oil and salt, needed major tweaking. But the bigger problem was, after eating it, I felt bad. The second year we used 50% oat flour and 50% of my own homemade flour mix, and it was almost palatable, but I still felt bad after eating it. Conclusion, no more oats for me. This year, I used only my homemade gluten free flour mix and water, it agreed with me, and the result was excellent! When you have celiac what it basically means is that your body is not absorbing nutrients because gluten present in many foods prevents your intestine from absorbing the nutrients in the food. In essence gluten causes your body to starve itself. The only known remedy is to go off gluten, completely, forever, no cheating. When I discovered I had celiac disease I went to the grocery store and almost had a heart attack when I saw the prices of gluten free foods. In addition, most of the prepared GF foods had only the starchy flours in them and not the healthy protein rich flours. Quite soon, I purchased a flour mill, a home version, and started to mill my own flours. My friend, who has a son diagnosed as a celiac 30 years ago, gave me these basic guidelines for the GF flour mix. I now use all my old recipes, simply substituting the gluten flour with my GF flour mix and nearly all my recipes come out the same. Here are the guidelines: the only thing you need to remember when making your gluten free flour mix is to use 50% heavy protein rich flours ( brown rice, tourmouse, green lentils, red lentils, pea, millet, soy, amaranth, quinoa, teff, oats( if you can do that) and 50% light flours ( white rice, potato starch, tapioca, corn, corn starch). I also add psyllium husk for a riser which I prefer to xantham gum. You can mix and match as you want as long as you stay within the guidelines. I make about 24-35 cups at a time, writing down what I put in each time, in case I want to repeat it (which I rarely do). I have a canister of the flour in my fridge and store the rest in the freezer so I have flour available at all times. 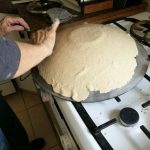 Making matzah is surprisingly simple, it is only gluten free flour and water. 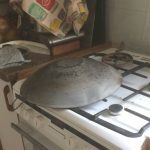 First you need a a hole maker which I found in a specialty kitchen store where the pasta making equipment is, and a “saj”, a sphere shaped cooking pot that is inverted over the flame. One could use a wok, instead, if you can’t find a “saj”, just make sure if it has a wooden handle that it doesn’t catch on fire! You also need a timer, a bowl, measuring cups and a rolling pin. Parchment paper makes transfer ( to the “saj”), and clean up easier. Remember you only have 18 minutes to mix , roll and bake. Our average time for one big matzah was 9 min. We make one at a time. 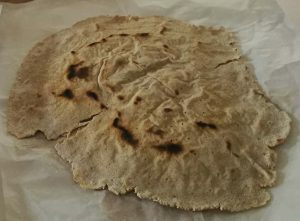 Here is the basic recipe for one large gluten free matzah: 1/2 cup of flour mix and a scant 1/3 cup of water. That’s all. 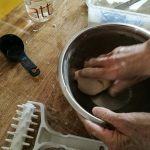 Here are some tips: You mix with your hands and you want to get a dough that is springy, yet not crumbly. I judge it by mixing it with my hands and running the dough ball on the side of the bowl to get any flour left there during the mixing stage. When the dough ball stays ballish, you are probably to the correct consistency. 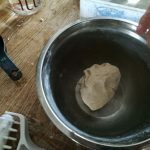 You may need to add more flour or water depending on your flour mix, but add either sparingly until you have a dough ball that doesn’t fall apart yet is not sticky. Don’t be afraid to experiment. 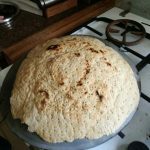 Roll out your dough as thin as you can, roll the hole maker over it, and transfer it to a very hot “saj”. The actual baking of a matzah takes 2-5 minutes, turning it one time after the first side bakes but doesn’t burn. 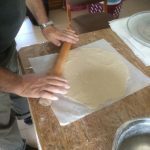 You can use a spatula to check underneath, and you will notice after about 30 seconds the dough will pull away from the “saj”- and become easy to maneuver. After you flip it gently reorganize the matzah on the “saj”. If you don’t rush it it will conform to the shape with steady downward pressure. The steam coming off the matzah helps with this. You are looking for it to be light brown in color on both sides. There may be a few burnt spots, and that is OK. This year we weighted the finished matzot under a plate so that they would be flat. Have fun and have a Happy Passover!